Technical preview versions of Windows 10 have been out there for months and have already started to get reviews from testers, but Microsoft had a big Windows 10 event last week anyway. Part progress report and part consumer preview, the event also served as a reminder than the much-maligned Windows 8.1 is not long for this world. One thing that got immediate attention: Microsoft announced that for the first year, Windows 10 will be a free upgrade for Windows 7 and Windows 8.1 users. Windows Phone 8 users also get the free update. To recap previous peeks, yes, the Start Menu — or a variation thereof — is back into the system, no add-on software required. Also, instead of having the old familiar Windows Control Panel in the Desktop Mode and the colorful “Change PC Settings” world of Windows 8 off the Charms bar, Windows 10 brings all the system settings into one place. And speaking of that frustrating hybrid of desktop and Modern UI, there’s a Continuum feature that automatically switches the interface between the more desktop-y mode with floating windows to the full-screen app style of the touch interface. The Notifications Center, or Action Center, will let you adjust settings with one click. 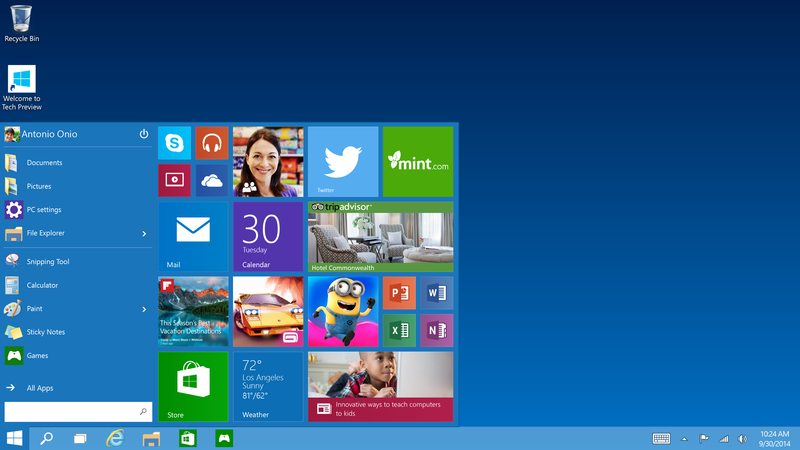 That new streamlined “Project Spartan” browser (still a code name) has been confirmed for the Windows 10 mix. Among other things, it’s got markup and a reading list function built in so you can spend more quality time with your webpages. As previously leaked to Windows Watchers, Cortana, the voice-activated personal assistant from Windows Phone is coming to Windows 10. You can verbally command Cortona to pull up files and photos, just like those computers do in the movies. The Xbox and Windows X, er 10, are also going to be getting a lot closer. 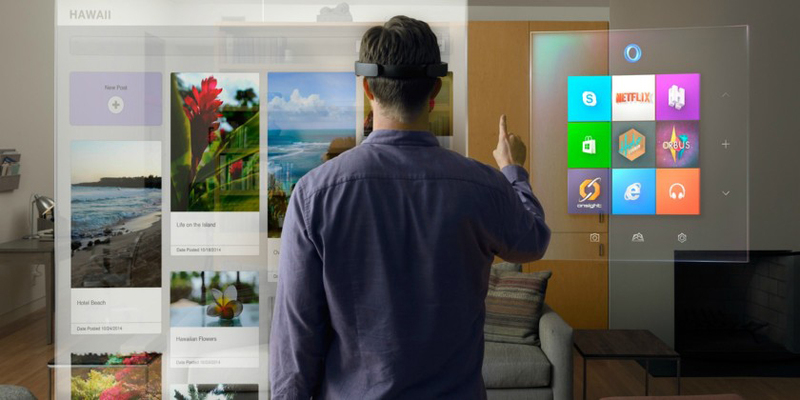 However, it was the HoloLens headset and its gesture-based holographic projection system that got most of the attention at the Microsoft event. These augmented-reality goggles were demoed (and some journalists got to try them out) for the first time in front of an audience, and earned a number of predictable ooohs and aaahs. Microsoft managed to cram in quite a bit into the event (check out the video supercut from The Verge to see the highlights) and the company’s shift into a more nimble, less-tied-to-selling-boxed-copies-of-Windows way of life has gotten praise. 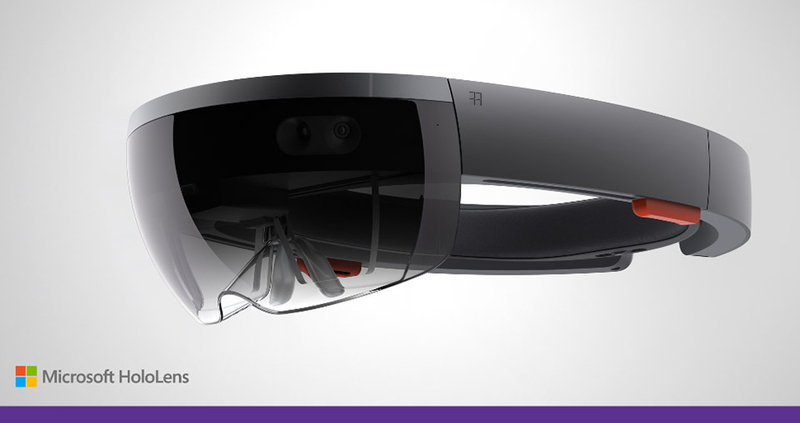 But it may be the HoloLens that got developers and other techies excited about Microsoft again — after the high-tech goggles were unveiled, tickets for Microsoft’s 2015 Build Conference sold out in less than an hour. 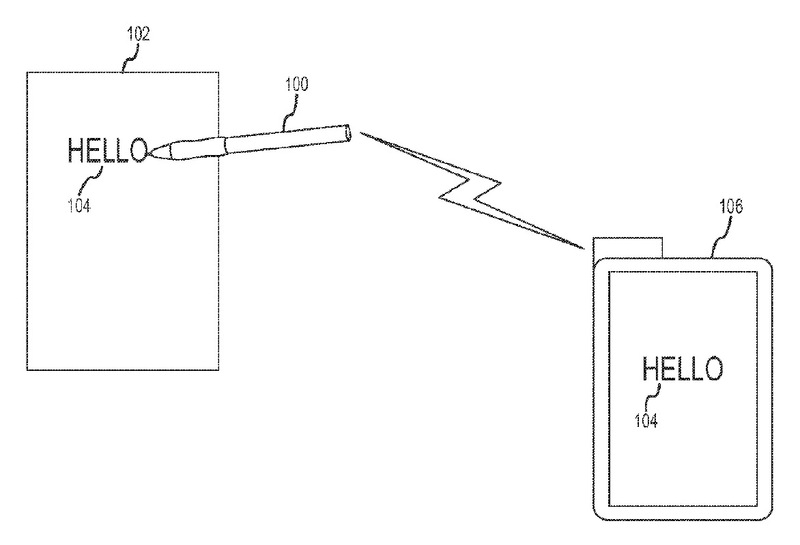 Game on, Apple and Google. Will the Drama Llama ever leave Sony’s living room? While US officials are thinking North Korea had some help or perhaps subcontracted the job, the hermit kingdom is still denying involvement and threatening retaliation, (as it often does). Not everyone is convinced North Korea did the hit, however, as some cybersecurity experts are questioning the FBI’s investigation into the matter and are now dubious as to the assumed motives and methods. Speaking of The Interview, the film made about $3 million in theaters and about $15 million in online streams at Google Play, YouTube and Xbox Video on Christmas Day. Also on Christmas Day: hackers took down Sony’s PlayStation network, as well as Microsoft’s Xbox Live network in what was thought to be a opportune-yet-unrelated-to-North-Korea attack by the Lizard Squad. And yet, a hacker’s work is never done. A member of Europe’s Chaos Computer Club is claiming he can fake a fingerprint and potentially fool a fingerprint scanner with high-quality digital photos of the aforementioned finger taken from afar and commercially available software. A video of the demonstration is on YouTube, but it’s in German. (Sprechen Sie Deutsch?) The Chaos Computer Club has claimed to have beaten Apple’s Touch ID scanner on the iPhone 5S before, and say vulnerabilities still exist in the iPhone 6. Sony may have had a rough year, but its old PlayStation 3 game consoles are doing their part for science, like helping crunch data in the study of black holes and gravitational waves. The New York Times has the story of how a scientist in the University of Dartmouth’s Physics Department has been making his own supercomputers by networking together stacks of old PS3s. In space news, a recently discovered comet called 2014 Q2, also known as Lovejoy, should be visible in the night sky on the Northern Hemisphere for much of January if you live in an area free of light pollution. 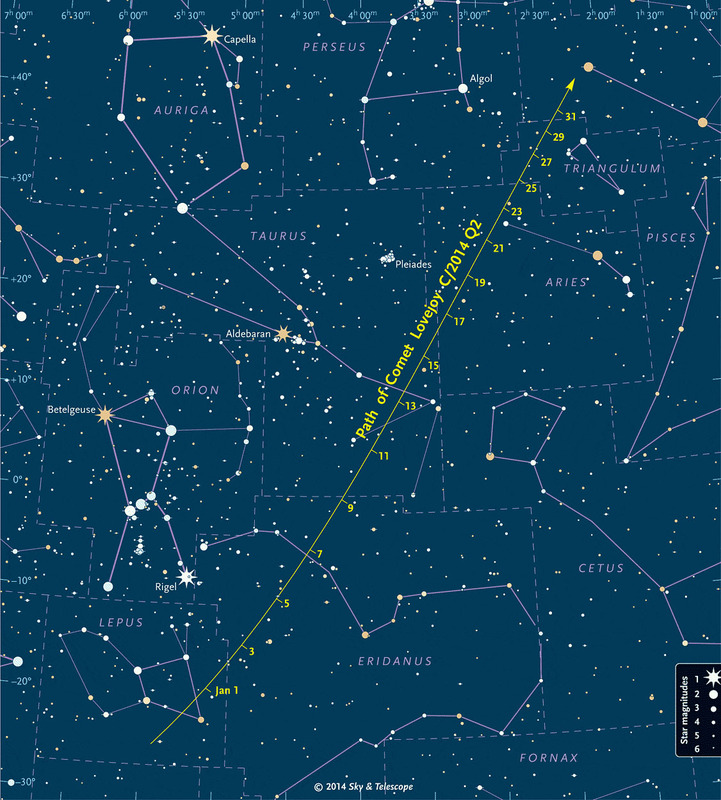 For experienced stargazers, the comet is currently near the constellation Lepus the Hare and is passing close to Orion’s belt on its way to the constellation Taurus the Bull by January 9th. It the Department of Out with the Old, Yahoo has now shut down its long-serving Yahoo Directory, a page of categorized topic links that had been around since 1994. And while it seems like Internet Explorer has been Microsoft’s browser since the dawn of Web Time, but new reports say that the company is building an entirely new browser codenamed Spartan for its upcoming Windows 10 system. In legal news, the United States Bankruptcy Court here in Manhattan has ruled that Aereo — the now-squashed teeny tiny antenna company that got sued out of business for redistributing broadcast TV signals — can sell off its technology to the highest bidder. The Consumer Electronics Association’s CES tradeshow opens next week in Las Vegas and its planners say the 2015 show will be “the largest ever Internet of Things showcase” with more than 900 exhibitors rolling out their future wares. New products for home security and climate control systems, automotive connectivity, kitchen appliances and more are expected, as well as new innovations in sensor technology. And finally, the Alternet site has put out its list of Biggest Product Fails of 2014. 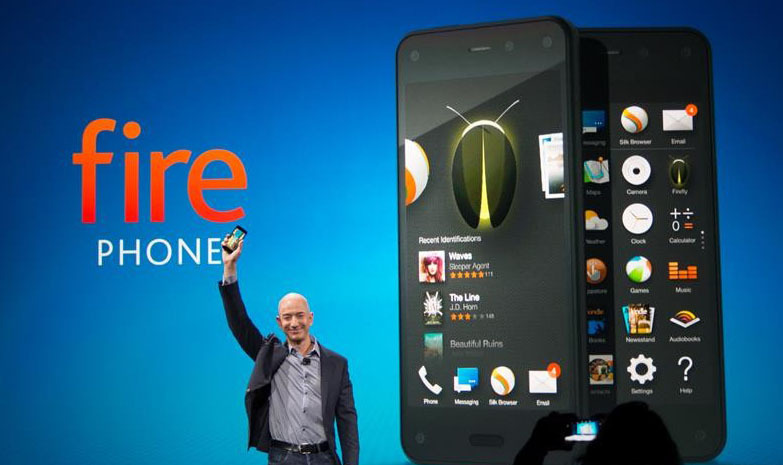 At the top of the flop list: the Amazon Fire Phone. At least the Fire Phone is topping a list somewhere, although it’s probably not the one Amazon had in mind. Happy 2015, y’all!